Luxuriously equipped apartment 5th Floor is located at Vasina street in very hart of Belgrade downtown, in the center of different events. 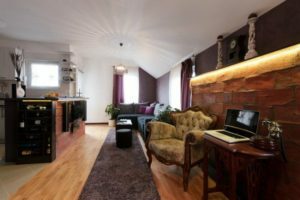 The apartment is equipped with security door, elevator, central heating, TV, iron, hair dryer, air conditioning, bedding, towels… In addition you can find in apartment: cable TV, internet connection and WIFI. On the same floor is the Apartment 5th Floor 1 (sutable for 4 persons) so if you need accommodation for more people, 5th Floor Apartments are great solution for you (thay can be sutable for 11 people). Apartment 5th Floor 2 has luxuriosly equipped living room with sitting area and double bed, sleeping room with 3 single beds, bathroom, large terrace from which you can enjoy an unforgettable view of Belgrade. The apartment can comfortably accommodate up to seven persons. If you need you can use a kitchen which is located in a spacious area in front of the apartment, that guests of both 5th Floor Apartments can use. The apartment 5th Floor 2 has two bedrooms. One of them has a double bed and the second one has 3 single beds. If you travel by car, you can park your car in the garage at the Obilicev venac. Apartment 5th Floor 2 enable guests to enjoy in comfort and luxury that provides privacy. Please choose 1-2 persons"3 persons"4 persons"5 persons"6 persons"7-8 persons"